Our clear glass cosmetic jars feature thick walls and come with silver F217 lined caps. 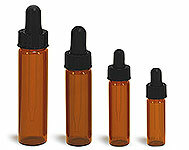 The wall thickness for these glass jars can be selected in either 1/4 ounce, 1 ounce and 2.3 ounce thickness. These jars are sold in cases of 48. The glass jars can be used to package all kinds of cosmetics, powders, creams, and much more!